Thanks To all of you For Your Love & Support Always. ?? Today I’m Here To Review The ” No Resolutions “January Glamego box ! It contains products from Premium brands worth Rs. 2700/- only for Rs. 299/- ! Isn’t That Great Now ! 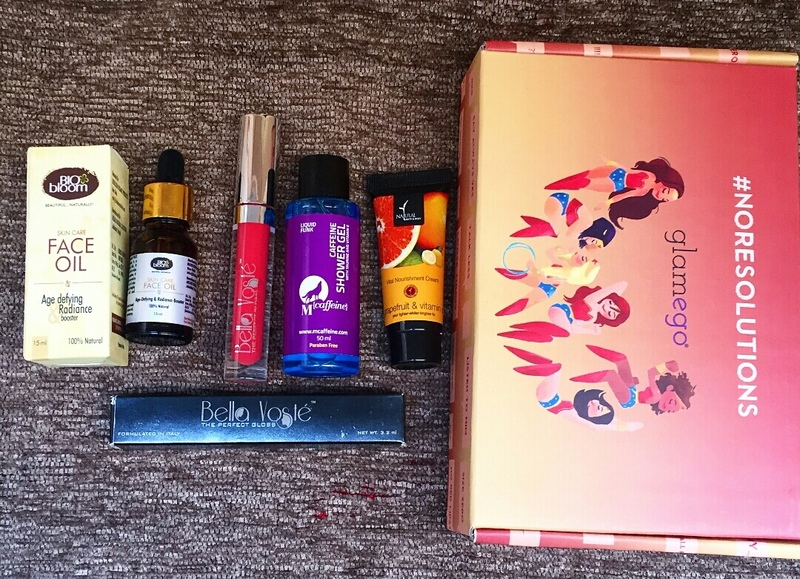 As You all know, GlamEgo is the India’s No.1 beauty subscription box ! Each Month You will Receive Amazing Set of Makeup and beauty products , delivered right at your door step ! Take a Glimpse Of What All Products i receive inside this Month’s box ! This Is How The Box Looks From Outside ! The Theme Of The Box Is so beautiful and funny. All the Resolutions which we usually do/ commit for the Coming “New Year” are described beautifully on the back Side Of the box. I totally loved this theme. ?? Please Refer the image below Carefully to see , how it looks ! & When I Opened The Box I Found 4 Premium Beauty & Skincare Products Inside ! There are Total 4 no. of Products Inside The Box ! Let’s Talk About All Four “Lap Of Luxury” products One By One ! This facial oil is 100% natural and effective. Its miraculous blend of essential oils enhances Skin Radiance and aids in skin tightening, lightening & rejuvenation. Comes In a 15ml glass bottle with dropper for easy usage . Priced At Rs. 1499/- , this Radiance Oil is a blend of Apricot kernel oil, carrot seed oil, rose-hip oil, geranium oil, lemon oil, frankincense oil, myrrh, rosemary, vitamin E & Evening Primrose ! Disperse 3-4 drops onto your finger tips, rub fingertips tightly together and gently press oil onto your cheeks, forehead and then chin in a circular motion. Leave on for at least 30 minutes. Leave on overnight for best results. In Short , this oil will definitely gonna prove the Perfect Ideal Product For Your Skincare & Makeup Regime after few usages only ! The Bella Voste, Perfect Gloss is designed to provide Fuller Lips In a Rich And Sophisticated Veil Of Color ! I Received It In Shade ” Pop Of Pink ” , Perfect For every Season. A silky gloss that boosts hydration and plumps lips with moisture for a colorful glamorous shine. Apply directly to your lips for a high-shine look . It even can protect your lips from drying in winters. The Gloss Comes in a sleek packaging, with soft feather like applicator. Weighs 3.2 ml for Rs. 599/- only ! Concocted in a base of coconut oil, tender coconut milk, almond oil and shea butter, this cream is whipped lightly to a smooth texture. The spalsh of Grapefruit oil known for its natural skin lightening properties give the skin an even tone and the reason not to use makeup. This Mcaffeine shower gel helps you get refreshed, energized and charged all day long. Caffeine infused in the gel removes the dead cells and gives your skin a healthy glow. It hydrates your skin and soothes it. It cleanses the skin while its bubbles and intoxicating minty scent will leave you feeling refreshed and revived. This product is paraben free. And not tested on animals, just party animals. ?? Loved Each & every product of this Month’s Box especially the Bio Bloom Radiance Oil. All products Smells Amazingly Awesome are really very effective ! & Will definitely Thank me Later. I Hope You All Find My Reviews On Them Helpful. So Like & Share your thoughts In The comment Box Below . Have A Fabulous Weekend Sunshines..
Also Don’t Forget To Check The Review Of December Glamego Box ! Great unboxing and review..the theme noresolution seems exiting with products of Bella voste inside . Glamego is a wonderful box. Always impresses me. This box too contains nice products. I was contemplating to get this beauty box and this review has given me an added yes to got for it. The beauty oil looks perfect.How long before the effect shows? Bahut affordable box hai ?? face oil star product hai ?? That’s a very well – curated box. Especially the oil. That too at a steal of a deal. At that price it is quite unbelievable what they provide. Truly the cheapest subscription box in India. This looks like an affordable box of natural products. I will try this for sure. That’s an incredible box for such an unbelievable price! Congratulations on the self-hosted part. I loved this unboxing. Products look amazing.